I had a neat request come up. My cousin is in the process of building a new house. In which they sold their old house, and are in a rental property for the time being. What is convenient is that their rental property is directly behind his in laws house. Being that Internet is expensive in his area, and even more expensive to setup. He asked me if there was any way for him to get Internet groom his in-laws to his rental house. Though the houses are on the same block, there is a home between them. So running a cat 6 cable wasn’t an option. They needed a way to expand their wireless network, without digging, running, or placing cables. The solution, expanding the network using a point to point system. A Point to Point wireless network is when you use a microwave dish and shoot a network connection to another microwave dish. In this case our microwave dishes shoot within the ranges of 5.0 GHz and 2.4 GHz. If you are familiar with these ranges of radio waves you will know these are the frequencies that Wi-Fi use. This is important because local government and the FCC don’t require special licenses or permits to use this range of frequencies. Which allows households across the country to have reliable wireless networks within their homes. The purpose of a Point to Point system is to expand these already wireless network, which operates in these ranges of frequencies. This allows bypassing those laws, and makes this solution available to anyone with a some or limited networking experience. This diagram depicts a very high level of how a Wireless point to point system works. Beaming the signal from one dish to another dish, while containing the same local network. This is what allows any home to use Wi-Fi within their homes to create a Wireless Local Area Network (WLAN). So the idea with my cousin’s situation was to expand his in-law’s WLAN to his rental home. To achieve this we used two Ubiquiti nbe-m5-16’s. The NanoBeam M5 (nbe-M5-15) is a tiny, powerful, PoE Microwave Dish, which not only transmits but also receives signal. It runs on the 5 GHz frequency, has 450+ Mbps throughput, and can shoot a signal up to 5 miles (if it has direct point of sight). When we purchased them, their cost were relatively low. With the total project only costing around $170. That being the two M5s, mounting pole, window mount, and Cat 6 cables. This video is a Vlog like video where I am testing the NanoBeams and configuring them. Installing the NanoBeams was such a simple process. We installed the pole for the bridge on the roof of my cousin’s in-law’s house. Attached the NanoBeam to the pole and pointed it in the direction of my cousin’s rental house. (There is a level bubble on the NanoBeam that needs to be oriented on the top of the NanoBeam, being as level as possible.) We then used Ubiquiti’s window mount, which looks very similar to a Go Pro mount, and oriented this M5 towards the bridge. The one mounted on the window acts as the Access Point for the rental house. I was surprised how well the speeds where. The in laws house receive speeds of 15 Mbps from their Internet service provider. The speeds the rental house was getting were around 10 to 13 Mbps in speeds. I was surprised how well it worked. Granted, we probably could of got the full 15 Mbps with some software configuration of the M5s but we were happy with our results so we left them as is. Leaving them as is, was basically default settings, beside switching which mode they were in. 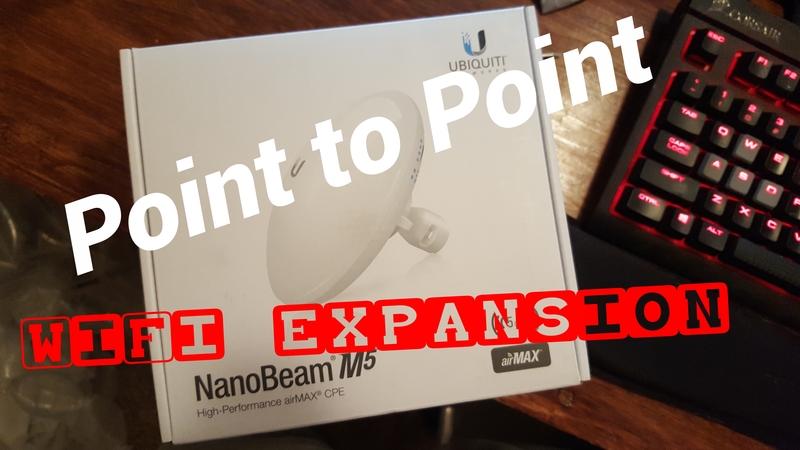 If you are looking for a relatively inexpensive way to expand your home network, a Point to Point system might be the solution you are looking for. Especially in cases like this where it isn’t advantageous to run a long network cable. The results in regards to speeds, configuration, ease, reliability, and cost were in the ideal range for a project of this spec. There are many reasons why one might want to expand their network. Wither one is looking to expand network from one physical building to another physical building without running cables, wants to put several I.P. cameras around their property, want to share Internet :), or any other reason to expand a network. Using a Point to Point system like this might be the best possible solution, next to running cables. However, with the throughput and the ability to shoot a signal up to five miles, these Nanobeam M5’s are very compelling. Especially, for the price and ease of use. Next Next post: ✔️ SOLVED! | Android Studio 3.+ AMD CPU Error: x86 emulation currently requires hardware acceleration.